I would like to tell all of you or who every is reading this e-mail, that this fishing trip was not planned by me, it was a gift from God. My husband has wanted to go fishing for a long time, but because of his disability he was unable to go. Last month or the month before last, I went to a Senior Citizens meeting at Open Word Christian Ministries, and we all introduce ourselves and gave information according to our background, family and work experience. The group was very interesting and pleasant. One person out of the group was Mr. Blake, he heard my speech and the next thing I knew he offered a free fishing trip to my disable husband, who wasn't even at the meeting. Well, God works in mysterious ways. I didn't even know Mr. Blake, that was my first time meeting him at the meeting. And I was shock when Mr. Blake offered my husband a free fishing trip - to Florida. Well, my husband and I went on the trip (4/28/07). 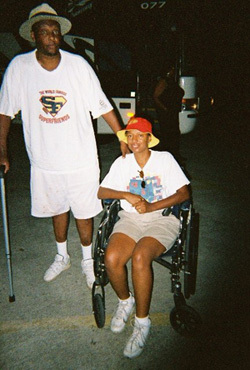 Mr. Blake had gotten a wheel chair for my husband, so that he would be able to fish and get around without walking in constant pain. We went to Panama City Florida, and the weather was beautiful. The group we went with, were very pleasant and helpful. And my husband caught four fish, he felt like a king (smile). You will be surprise what fishing will do for someone that is disable. Mr. Blake and his assistant (Fred) was very courteous , helpful, and pleasant to me and my husband. I just want to thank everyone for there kindness and helpfulness in assisting me and my husband in a time of need. Thank you, your kindness will always be appreciated and never forgotten. Good morning Robert, It's Kenna Herring. I just wanted to thank you for the great experience of such a wonderful fishing trip. My husband and I really enjoyed it. I am sending this e-mail to remind you post a picture of my husband Shawn R. Herring and myself Kenna U. Herring on the front page of the internet. 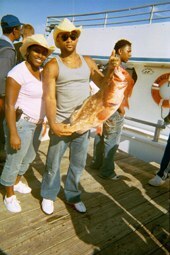 As you know he was the one who caught the 14lb grouper on the April 28, 2007 fishing trip!!! He would like for his name to be Shawn R. Herring AKA "Cowboy" as you stated on the website. I already have approx. 8-10 people wanting to go so far on your next June 23, 2007 trip. Please feel free to e-mail me. Thanks and have a blessed day!!!! 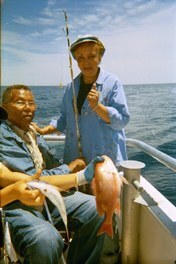 We had such a great time on the joyful events fishing trip on September 17, 2005. My husband and I both have physical challenges. He walks with a cane and is visually impaired and I am in a wheelchair. Mr. Blake personally greeted us at the rendezvous location for the trip and took us to the bus driver who saw to it that our belongings, including the wheelchair were safely stored. We rode in luxury with reclining seats and DVD monitors. Mr. Blake made sure that each and every person was taken care of. Once we arrived in Panama City Beach, Florida we prepared to board the boat. The crew was wonderful and right there to help with each step of the fishing process for those who were in need of assistance. Throughout the trip there was always a genuine concern for safety and a true desire to have fun. If we can go out and have fun anyone can. The sky is the limit! Thank you for your wonderful hospitality!